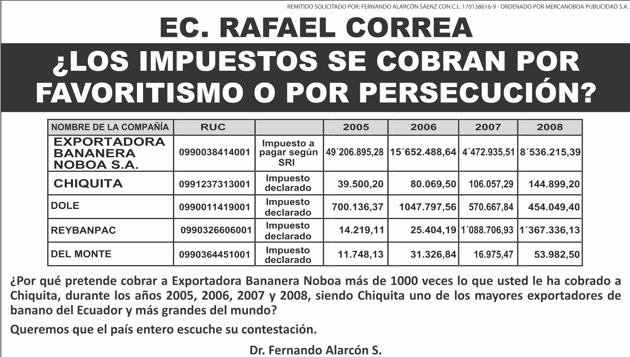 Economist Rafael Correa: Are the taxes to Exportadora Bananera Noboa charged by favoritism or political persecution? Are the taxes to Exportadora Bananera Noboa charged by favoritism or political persecution? Why do you pretend to charge Exportadora Bananera Noboa over 1000 times more than you have charged Chiquita, which during the years 2005, 2006, 2007, y 2008, Chiquita has been on of the biggest banana exporters in Ecuador and in the world? We want the whole country to hear your answer.